I think all of us suffer from our own form of haji, i.e. the inability to have people over at your house without stuffing them full of food, notwithstanding the 3 courses that will follow. So I made deviled eggs, a relatively new discovery for me. Until I became friends with Eric and Stacy, I’m not sure I ever ate a deviled egg in my life. The shrimp-stuffed ones in New Orleans were simply ridiculous. 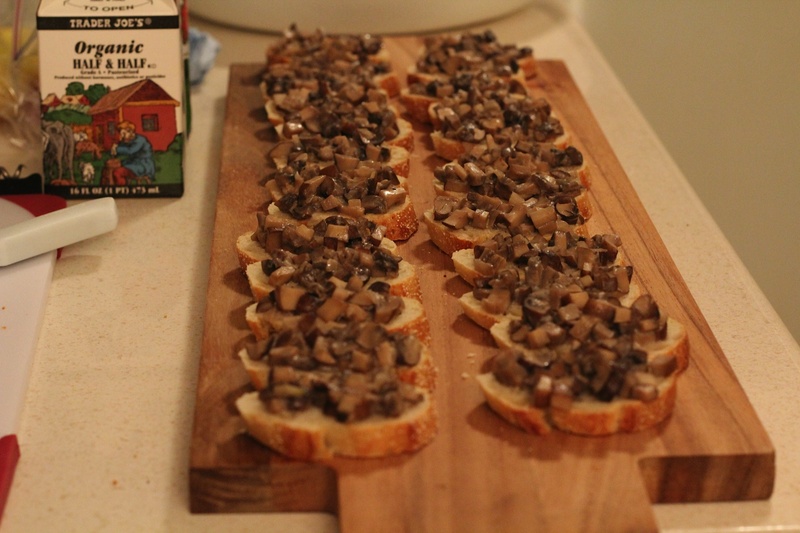 I also considered my recent obsession with mushrooms and made a little minced bite on toast. Bring a small pot of water to boil, then add the shrimp. Cook until pink, about 2 min. Remove, set aside to cool, then chop into pieces small enough to fit in an egg yolk-sized crevice. Boil the eggs, peel, slice in half lengthwise, and remove the yolks. Put yolks into a bowl. Put cooked egg whites in fridge to harden. Mash yolks with fork and add all ingredients. Spoon the filling into the egg whites. Pat yourself on the back for your abilities. Heat butter in skillet on medium high, then add shallots and cook till limp. Add mushrooms and saute for a few minutes until very soft (add more butter). Add the wine, cover, reduce heat to medium, and simmer for 5 min. Uncover and simmer until most of the liquid is evaporated. Add the cream, simmer a minute or two, and then season with lemon juice, salt, and pepper. Note: I also made a non-dairy version using olive oil and chicken broth (added at the same time as the wine) instead of butter and cream. And a lot more salt. Not nearly as good — I wonder if some sort of garlic powder or cayenne pepper or something flavorful would have helped. This entry was posted in Appetizer, Recipes, Side Dish and tagged Mushrooms, Progressive Dinner, Shrimp, SOC. Bookmark the permalink. I think I shall tackle deviled eggs soon too – you’ve inspired me.